Nightfall is a shoal-draft gaff cutter and was built for W.D. 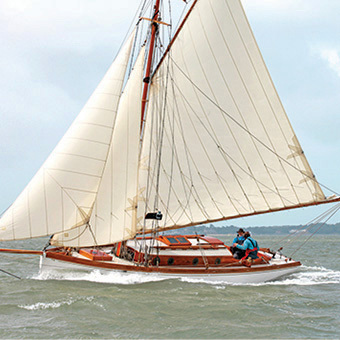 Silcock and his wife to gently sail on the Norfolk Broads and around the Suffolk Coast. She was designed by Harold Lidston who lived in Cowes. For several years she was owned by Maurice Griffiths GM, the former editor of Yachting Monthly, who immortalised her in his books and other writings. The preface of one of his books, 'Ten Small Yachts', was actually written on board her. Nightfall has been in the present ownership since 1984 and has just emerged after a 12 year restoration, which included a new hull, new deck, and interior all faithful to her original plans. "How warm and almost luxurious our cabin appeared as we sat back relaxed and contented after our meal. With a red glow from the stove and a soft light from the oil lamp there is for me no place in the world quite so warmly embracing and comforting as the cabin of a little yacht anchored in a sheltered spot." Nightfall previously had a stove in th 1930’s when Maurice Griffiths owned her, and we wanted to put one back in its original place so we could recreate the comforting roar of the fire and snug interior that she once had. We decided to purchase a traditional solid fuel stove specially designed for yachts. ‘The Sardine’ These stoves are built today the same way as they were over 125 years ago and are available from Andrew Moore of Navigator Stove Works USA they are constructed using the original patterns from the Lunenburg Foundry dating from 1891, as used by the fishermen and yachtsmen of Nova Scotia from the last century.